Indepth commentary, essays, reviews and analysis by Muppet/Henson historian d.w. mckim. Muppet Freak is about Fandom. Mostly Muppet fandom but this blog also touches on other areas of fandom not related to the Muppets as well as the concept of fandom itself (in general terms and the author's direct experiences). Some content may be controversial and solely represents the opinions of the author. Younger or more sensitive readers are urged to proceed with caution. The news of Nelson's demise is not unexpected. Due to his age, declining health, and the diminishing amount of time and energy he's spent over the past decade contributing to the Muppets (he had retired from physical Muppeteering though still providing voices for select characters), fans, family and colleagues have had time to adjust to the thought that Nelson may soon no longer be with us. Unlike Jim Henson's death which came far too early and without warning, this was no huge surprise that came out of nowhere. The Muppet team (both that of the Classic Muppets and the Sesame group) have had years to prepare for this eventuality with the training and recasting of most of his characters. His (LARGE) stable of beloved characters will still be around to make us laugh, cry and reach our hearts. Of course, that's by no means to say that the news is not sad. It's actually more bittersweet. While sad it's finally come to pass, it's actually quite uplifting to bear in mind that he did actually live as long as he did. He was around long enough to continue to mentor those taking on his characters but also to provide one last special "audio cameo" as an Announcer Voice for "The Muppets" film last year as well as recording his very own album, Truro Daydreams a few years back. I'm sure those close to him have had opportunity to let them know they loved him and when the end did come, it was in his sleep. 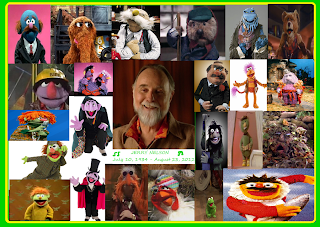 But for Muppet Freaks and fans worldwide, what makes Nelson's death particularly poignant is that this was the passing of one of the true long-time veterans...that special trio of Jim (Henson), Frank (Oz) and Jerry. Even though Oz is still with us, his direct ties with the Muppets has been almost totally cut for years now - basically limited to a few Sesame bits here and there despite his characters being all successfully recast and no real involvement with the Classic Muppets for a good decade. So while Frank Oz is still alive and seemingly well, when it comes right down to it, Jerry's departure really does feel like the last part of that particular team is completely gone. While many fans would love to see Oz take a more active role with the Muppets - even as just a creative consultant if not a performer (rather than becoming a bit of an "armchair quarterback" commenting on how they could improve rather than marching over to Disney and working with them, bringing his often strong opinions to the table as one of the last remaining disciples of the originators), this doesn't seem likely to happen. Thus, the loss of Nelson truly does seem to represent the end of The Trio. His departure really hits the Muppet fan community hard because of the subliminal recognition that it represents an ending of an era. But moving away from the conceptual and to the specific, Jerry Nelson was an amazing talent whose multiple contributions to the Muppet team will be sorely missed. Of the Classic Trio, Henson and Oz were the more forefront, taking on the lead characters and having much more of a general public name recognition. But Nelson was the important stock player of the three, able to supplement the world of The Muppets with any and all kinds of supporting character. Name an accent and Jerry could do it. He had the ability to take on any kind of character from largest (Snuffleupagus) to smallest (Robin the Frog), male or female or other, sweet to sour. 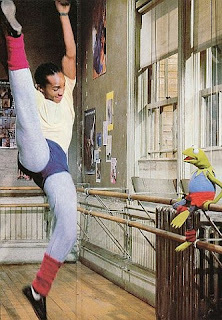 Henson referred to Nelson as "the Mel Blanc of The Muppets" with an incredible range of voices. And of all Nelson's attributes and long list of talents and abilities, it is his voice that will always most be associated with him. Not only due to his range but also its resonance - he would typically be called upon whenever an "Announcer" and/or "Voiceover" part was needed. Indeed, even though all his characters were puppeteered and voiced by others in 2011's "The Muppets", Nelson still lent his unmistakable voice as the Muppet Telethon Announcer adding an element to the film that wouldn't have seemed right if not somehow present. (Tell me you didn't weep with joy when you heard him). As you can see (and hear) just as exhuberantly as The Count is throwing himself into counting, Jerry is throwing himself into the song! Welcome to "Good Business/Bad Business", a look at how well (or how horribly) companies entrusted with preserving the legacy of Jim Henson's creations and characters are living up to the task. I'm kind of hesitant to call this a "series" or even a "miniseries" for that matter due to (a) concerns about how much longer i'll be around to do Muppet Freak (i'm already on borrowed time) and (b) when it comes right down to it, articles like this really shouldn't even have to exist. If a company is completely true to the spirit of Henson, doing the right thing should always come naturally. "Bad Business" articles shouldn't ever occur and "Good Business" articles should be as newsworthy as the sky being blue another day. But two recent events in the world of Muppet/Henson fandom really do deserve special comment. The "Bad" example is an article i've had in the works for months now and have been hinting at for quite some time. The "Good" example is however such an extraordinary example of how Henson-Legacy Companies should behave that a direct contrast between the two really highlights the extreme differences between them so it's through that lens that i shall discuss them here. So let's kick off with our "Good Business" Spotlight on The Jim Henson Company for its stance against corporate-sponsored bigotry. How many of us have Jack in the Box Muppet figures sharing shelf space with our Palisades Muppet action figures or still have - and drink out of - our McDonald's Great Muppet Caper Glasses? Henson's partnership with Chick-Fil-A was hardly new. As early as 2003, CFA was offering Bear in the Big Blue House books and just last year, as Pajanimals was celebrating its expansion from shorts to a television series in October, Pajanimals board books were offered at the chain with Melissa Segal, SVP of consumer products at Henson Co. noting at the time: “Chick-Fil-A came to us awhile ago. With the series also launching on Sprout this month the timing just couldn’t be better." Because of the success of the Pajanimals books, Henson partnered with CFA again this year, this time with a promotion themed around the Jim Henson Creature Shop. But not long after the start of the promotion, one of CFA's "dirty little secrets" had become increasingly public knowledge: that they had been donating millions of dollars to anti-gay organizations since 2003 including Focus on the Family, Exodus International and the Family Research Council. The recent headlines and media spotlight on this issue put Henson in a rather horrible position. 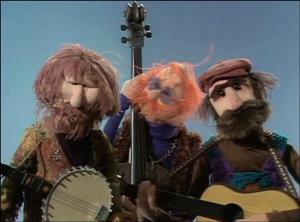 The bulk of Henson's works have centered around themes and messages of diversity, non-discrimination, equality, and peace - and now here they were directly connected with a company at a time when they were unapologetically not just advocating the exact opposite but also contributing to causes dedicated to denying gays and lesbians civil rights. Henson fans who were aware of CFA's actions at the time the cross-promotion was announced were already wondering if their support of Henson was strong enough to justify handing over money to a chain that would likely use those same dollars to fund the opposition of civil rights - just to pick up a Henson themed finger puppet. Likewise, besides discussing their quandary among fellow fans on message boards/fan forums, they also asked Henson if they were aware of the nature of CFA's activities and how a "good boy like you could get involved with a thug like that"? Deciding that the Henson name and legacy simply could not be seen to be affiliated with homophobia and bigotry, Henson ended the partnership and pulled its toys. 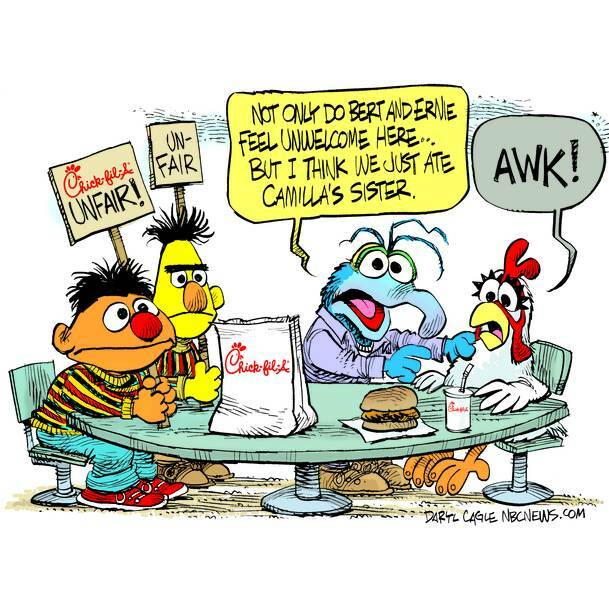 On July 20, they issued the following public statement: "The Jim Henson Company has celebrated and embraced diversity and inclusiveness for over fifty years and we have notified Chick-Fil-A that we do not wish to partner with them on any future endeavors. Lisa Henson, our CEO is personally a strong supporter of gay marriage and has directed us to donate the payment we received from Chick-Fil-A to GLAAD." (GLAAD being the Gay and Lesbian Alliance Against Discrimination, for those unfamiliar with the acronym). Take very special note of the above statement. Lots of people have since attacked the Henson Company for its stance hurling lots of false accusations against them. Their statement simply acknowledges they have different business philosophies and as a result decided a partnership would not be a good thing. That's the first of these two sentences. The second sentence assures Henson fans and those concerned with equality and civil rights that rather than just pocketing the money CFA gave them, they decided to hand it over to an organization that will help fight for the rights of those who the organizations CFA funds would rather see stripped away. (It should be noted that even though the statement cites Lisa Henson's support of gay marriage, the organizations CFA donates to aren't just anti-marriage equality but any civil/equal rights for gays in general.) Note too what's NOT said. There is no call for boycotts. No negative language used toward CFA or its views/actions. They simply say "we believe different and we don't wish to be affiliated with them any longer" and they LEAVE IT AT THAT! CFA supporters will try to say Henson is "anti free-speech". For one thing, CFA isn't just speaking of a view, they're funding millions of their profits to actively deny people civil rights. But "just for the halibut", let's say hypothetically that it was just a matter of words and not actions. Henson doesn't say in its simple, short statement that others shouldn't have an opposite view - just that they themselves do and don't wish to further a relationship with CFA as a result (By terminating ties, not only wouldn't Henson have bigotry associated with its name, by the same token CFA could likewise be "freed" of their affiliation with a company they may be better off without). Wanna see something funny? (Sad and a little sick, but still funny?) Visit The Jim Henson Company's Facebook page. It's flooded with posts attacking them for being "anti-free speech"... yet Henson hasn't taken them down. Even if they don't disagree with you, they'll still let you post an opposing view on their page even if the manner in which you do so is slanderous and in all fairness really shouldn't be left standing on a page for a family-friendly company. Once again, Henson has taken the high road and has handled the whole situation with class and grace. By the same token, i would like to lead the call among Henson fans to similarly make a donation to either GLAAD or the gay/lesbian-friendly organization of your choice (lots of local organizations can greatly benefit from support just as much as an international one) - ESPECIALLY IF YOU PAID FOR A HENSON PREMIUM AT CHICK-FIL-A. Doesn't have to be big - double what you paid the CFA cashier is just fine! Paid $3 for a kids meal to get that Henson collectable? Give at least $6 to a gay friendly cause. Muppet Freak officially encourages Henson fans to follow the company's lead. Of course, in discussing the topic, there's a couple things i can't let slide. The first is the notion that "Gay" and "Christian"/"Religious" are opposites. That it's "one or the other". HOCKEY PUCKY!!! It's companies like CFA and the organizations they support that would like you to believe that but while such extremists seem to represent the "Official View" on the relationship between people of faith and gender orientation, in reality (away from the blare of media headlines) many people of faith not only recognize that the two really don't have much to do with each other nor are mutually exclusive but (SHOCK! HORROR!) it's even possible for someone to be BOTH gay AND Christian (or Mormon, Catholic, etc). Why, i'd bet that you probably even have churches near you that actually cater to the gay/lesbian community and/or has a congregation that's primarily made up of a gay/lesbian membership. Gay people-of-faith often tend to get lost in the media hype that often thrives on debate and "either/or"-focused "reporting" and i really think if more people took the time to visit a predominantly gay church service at least once a year to observe how the two can peacefully co-exist, these faux-"debates" would lose any relevance or credibility. Hey, remember how i just advocated for donating to a gay/lesbian friendly cause in the above paragraph? Why not the collection plate of one of your local gay friendly/focused places of worship? (Convinced there aren't any near you? Contact your nearest gay community hotline, magazine/newspaper, or group and inquire and prepare for a likely surprise! Look up "Metropolitan Community Church" in your yellow pages or localized Google search) Likewise, look into attending a workshop or checking a book about the historical depiction of homosexuality in the Bible. Just about every single Bible passage used to justify religious discrimination against gays originally used words that have no modern translation (describing specific rituals and practices specific to the time) and vary greatly in different publications of the Bible as to the words and phrases used to attempt to take their place. Spend some time looking at different versions/translations of the Bible and comparing the words used in other variations in contrast to those who erroneously use the word "homosexual" This is the #2 Big Thing that almost always gets ignored in the conflict-thriving media - if people took the time to actually LEARN what the Bible was originally trying to convey in the first place, religious opposition to gays and lesbians would be essentially meaningless and nonexistent. Sadly, antigay fearmongering brings in large checks to the collection plates of religious extremists so those who really SHOULD know better have a tendency to sit on this knowledge. But you don't need the Pat Robertsons of the world to be your sole source of religious education. Take the time to do the research yourself! But enough about all that "heady" stuff! Let's get to something REALLY important that any responsible Muppet/Henson fan blogger should discuss when writing about this subject. Since you know, actual legitimate news organizations no longer employ fact-checkers or value truth and facts over sensationalism and headlines... 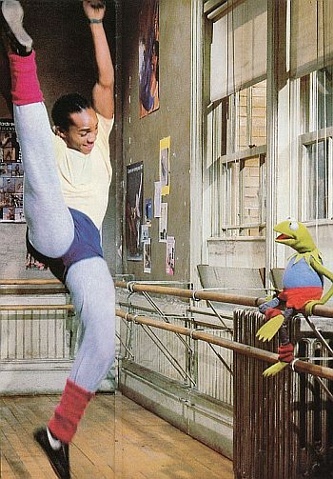 THIS HAS NOTHING TO DO WITH "THE MUPPETS"!!!! Note how they try to claim "June 19" as when they recalled the dangerous-toys-that-didn't-actually-harm-anyone-or-pose-any-real-threat-but-we-decided-to-be-"proactive"-since-some-fastfood-obsessed-kid-someday-somewhere-will-probably-have-fat-fingers-and-won't-have-the-common-sense-to-rip-it-off-if-it-actually-somehow-did-truly-get-stuck. June 19, the day before Henson's June 20 public statement. Nice try and valiant effort, Poultry Purveyors! But you forgot something. While our responsible news media that can't even get a simple fact like who owns the Muppets right are likely to give you a free pass since verifying the actual time of your claim would actually require, you know, work and actual investigation and all that nasty stuff, there's still those "meddling kids" that you neglected to take into account. Those regular Joes like me and you that can make some lil Google searches go a long way... You see, one of the nifty things about the internet-connected world is that everything's a great big Time Stamp. In other words, you can CLAIM you did something at a certain time, but people can actually verify the earliest something went online. The earliest reports of CFA's "finger hole follies" didn't hit the net til AFTER Henson's announcement. No Tweets, no Facebook posts, no photos, no anecdotes, no nuttin' prior to the 20th. 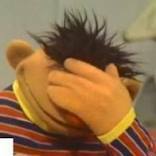 Why just look at the Muppet/Henson fan community - we know EVERY LITTLE THING that has to do with Muppets/Henson and post about/discuss it on fan forums the nanosection something happens. Yet NO ONE anywhere had any stories on a Muppet Message Board of "Hey everyone, i went to a Chick-Fil-A just to get my Henson toy and they told me they recalled them" before we were all abuzz about the Henson's statement? Methinks some chickadees got some egg on their face trying to fudge the date in a desperate p.r. move! Now, while i have a hard time believing that there could be any antigay Muppet/Henson fans (you mean to tell me you spent a LIFETIME following Henson's LIFE WORK dedicated to fairness, nonprejudice, and equality and you still ended up a bigot?) out there (You coulda knocked me over with a feather when i heard there were actually STRAIGHT Muppet fans in the world), no matter what side you fell on in the whole Henson vs Chic-Fil-A Brouhaha, the very moment CFA started to try to turn things around on Henson, then THAT should be the moment any Hensonite should have become hard-boiled against CFA. Ya don't mess with Jim. Now you've gone and made it personal - going from just being "antigay" to the more unforgivable sin of being "anti-Henson". So let's see? Anything else to be said before the Handing Out of Awards? Oh yes - not long after the Henson/CFA story became national news, the Democratic Party finally officially added marriage equality to its platform. 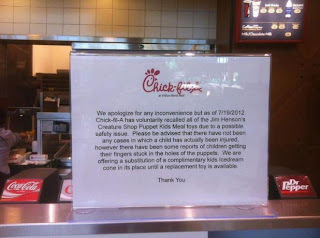 So thank you to BOTH Henson AND Chick-Fil-A for bringing the issue into increased awareness and attention helping to nudge history in the right direction. I don't mean to egg you on, but let's give give credit where the feather belongs in the cap! "Is that another CHICKEN JOKE?!" 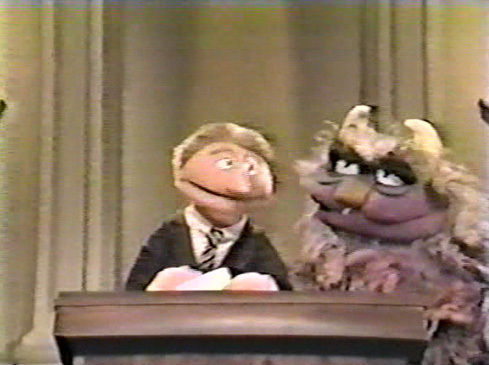 Alright, so now the moment you all have been waiting for.... For defending and upholding the honor of the Henson name, philosophies, and messages in the face of ugliness, slander, and even Diane Sawyer and sticking up for what's right and just all the while doing so with extreme class, honor, and dignity, Muppet Freak officially presents THE JIM HENSON COMPANY with its first ever "Good Business" Award, the coveted "ZELDA" ROSE!!! And while we're at it, even though these awards are just for the companies entrusted with Henson's legacies, it didn't seem right to not give Chick-Fil-A anything and let them go home empty handed, so especially for CFA... Muppet Freak, in honor of Henson and Muppet fans and Freaks everywhere - proudly presents you with a big rousing "CLUCK YOU!" The last couple of months has been a bit of a nightmare, so of course when your nightmares happen when you're awake, the solution is to stay in bed and be asleep as much as possible. But sooner or later, one has to get out of bed. Why? Well, usually to go to work. So this month, Muppet Freak is taking a trip to the office! We're going from the bedroom to the BOARDROOM! 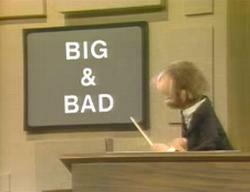 To elaborate, we have a special pair of articles coming up called "Good Business/Bad Business" where we take a look at both terrific and terrible recent business practices coming from the companies entrusted with the legacies of Jim Henson's creations. As for previous articles i've teased, they're on deck afterward...though one of them - that special major article i've been hinting at for awhile now confronting one of the most important and controversial issues confronting Muppet fandom - will actually be incorporated (no business pun intended) into this series. With my current schedule, the weekends are the most likely time for updates (Mupdates?) so look for Part 1: "Good Business" next weekend. 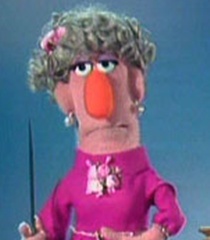 Who will be named the recipient of the first ever Muppet Freak "Zelda" Rose? And for doing what? For that matter, who will be the winner of the "Bad Business" Award - and what will it be called? Beats me. I haven't thought of a good Muppety name for it yet. Maybe one of YOU can name it and earn a special "Freakier Than Me" acknowledgement! What should be the flipside of a "Zelda" Rose? Whatever it is will probably have a similar play on words of a Muppet name. Got any suggestions? Include them in the comments! Hard to believe, but this week marks the third season premiere of "Pretty Little Liars". I mean it doesn't seem all that long ago that the show made its debut and last season's shocking finale only seems like it aired a couple of weeks ago. Of course a lot of the credit for that goes to ABC Family's ingenious way of airing its episodes...they break each season into two mini-seasons meaning that even though there's two major breaks between new episodes each year, they're only half as long as the traditional gap between seasons and that helps keep the momentum strong! A lot more television shows would do well to adopt this model. Not too long after the series started, it became a firm favorite of mine - a total cross between Desperate Housewives and Twin Peaks. Well-acted, written, directed and beautifully shot (with a nice healthy dose of all out creepiness each episode), it's one of those rare shows that forces you to pay attention - you can't just have it on playing unattended in the background. Blink and you may miss a subtle clue in the corner of the screen at any given moment. What initially drew me to the series was the announcement before shooting began that Nia Peeples, Laura Leighton, and Chad Lowe were going to be on a show together called Pretty Little Liars. That's all i knew at the time; i knew nothing about the kind of program it would be and i hadn't heard of the book series it was based on...just that combination of actors was enough to pique my interest! Then of course in the time between that announcement and the debut episode, i learned the premise and of its pedigree and even though my hopes weren't as high that it would be any good, i tuned in - and was blown away. My concerns about this being a disposable piece of fluff evaporated pretty quickly once "Directed by Lesli Linka Glatter" appeared on screen as she's one of the most outstanding directors working in television so i knew if she was directing the pilot, this was going to be a quality program. I've known of Chad Lowe (Byron Montgomery, Aria's dad) for a long time and i always loved Laura Leighton (Ashley Marin, Hanna's mom) on Melrose Place (Heather Locklear may have been the "name draw" but it was always Laura Leighton and Marcia Cross that you'd be talking about at the watercooler at work the following day!) But i was especially excited to see Nia Peeples take on the role of Pamela Fields, Emily's mom. Nia had been one of my favorite actresses on Fame - my favorite show during high school. For those too young or who don't remember, Fame (based on the 1980 film of the same name) was basically the 80s version of Glee - a musical drama based on the lives of the students and faculty of the New York High School of the Performing Arts. Nia's character, Nicole Chapman, didn't come on until season four (though she did have a three-line role in a season two episode) but she immediately became one of my favorite characters in between her overachieving perfectionist streak (which i totally identified with at the time) and her amazing voice. Nia's work on PLL has been especially strong and she has one of the cast's biggest challenges - to make what could easily be a very unlikable (and easily stereotypical) character into a three dimensional sympathetic one. Because of Peeple's performance, the Mrs. Fields of the television show is nothing like the one from the books. Nia plays a mother with a strong conservative background having to come to terms with her daughter's coming out as gay. Instead of the cardboard villainess most shows and actors would choose to portray such a character as, not only do we see her go through all the multi-layered steps of acceptance, but we feel her pain and struggle as much as we do the daughter's. This is not a role for a lessor actress and Nia has really been just beautiful with her performances. I really look forward to when she's onscreen...and with the amount of talent that makes up the PLL cast, that's saying quite a lot. ...So if you only know Nia as "Mrs. Fields", hold on 'cause you're in for a surprise!!! And now starting our tour of Nia's best musical moments, here's Nia with Cynthia ("Holly") Gibb and some actress named Janet. Nia takes on Aretha Franklin's "Another Night"
Now this one's a real treat...SUSPENSE! 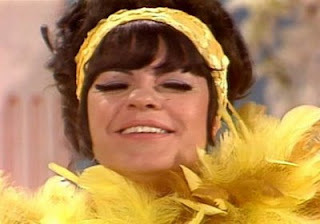 Not only is this one of my all time favorites from the show's run (appearing in one of my fave episodes, "The Monster That Devoured Las Vegas") but this one also features Valerie Landsburg's Doris - who was my favorite character/singer during the series' first half. And if that wasn't enough...FLYING FRUIT at 1:48!!! ...And since i'm not so cruel to finish on that note, here's a true grand finale...the final number from the show's last episode...the cast - past and present - perform the theme song. Now Nicole had been killed off mid-season so she's not seen here...but i think she can still be heard! During the line "Ooh, I've got what it takes" (at 2:24), that sure sounds like her singing and i'd be willing to bet (though i've never seen it acknowledged anywhere) that she sang in the finale without appearing onscreen. Whether or not she's actually included, this was the perfect ending for the show - and this retrospective. [Usually when i repost an article from the archives, i include my current commentary at the end, but this time it seems better to preface the old post with a current introduction. Due to a sudden number of personal tragedies i'm contending with all at once right now (including but not limited to being laid off - the recession claims yet another statistic! ), all my attention/energy is elsewhere and i can not currently maintain this blog. I sincerely love writing detailed thoughts about the Jim Henson Company and the Muppets as well as my other areas of fandom and i hope that current readers enjoyed reading the things i had to say and that those discovering it later find some value in the archives. At this point everything in my life is very uncertain, including how much time i may have left, so not only can i give any kind of estimate as to when it will be active again, i can't really even say IF it will be active again. If i can revive it later, trust me - i will. But right now all my fandoms are on the very bottom of the priority list. The archives will still be kept up here in the event that things somehow end up getting better and everything can return to some degree of normalcy. Should that happen, i'll pick up where i left off. But if it doesn't, you'll at least have a few months worth of some stuff i hope is of great value to some of the people who come across it. 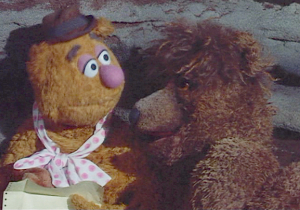 Thanks for reading - and thanks to all the various Muppet/Henson fans i've corresponded with over the years online, offline or both...it's always exciting to connect with people who share the same loves. Those are some of the best memories i'll hold onto as long as i can. In the event this is my last ever entry here and/or on other fan forums, i'll close with the following thought. Right now there's a lot of ugliness in the world. Names don't need to be mentioned but we all know there's been a lot of world "leaders" who were so driven by personal greed and contempt for large numbers of society (particularly the lower and middle class) that have really harmed the livelihoods of a vast number of this country's and the world's citizens in the last decade. I implore everyone who's been touched by Jim Henson and all the team he's gathered who have carried on his visions since to keep alive the spirit of the values he tried to impart in those he touched via his works or his life. Be kind to one another, help those less fortunate, take care of the environment. Pass it on. 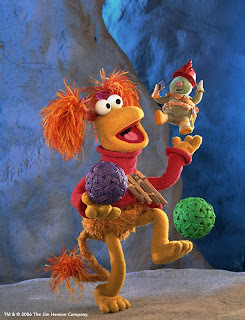 Fraggle Rock may not have achieved the goal that Jim stated in that first boardroom meeting of sowing the seeds of peace and stopping all war in the world, but as long as his fans are alive worldwide, maybe they can do what they can in their own ways to make the world a little better one step and one day at a time. Ernie: Hey, Bert - Bert! Let's go, Bert - it's time to leave, Bert! Bert: Uh, Ernie - hey, Ern, no. You go on without me, I'm not going to come with you. Ernie: Oh but Bert, wait a second. We've been planning this trip for a week - it's time to leave. Bert: But Ernie, I can't go out - I can't go out with you. Ernie: But Bert, why not? Okay, so my hands aren't purple. At least not right now, though they did have slight hints of purple at first. This last week, i had a very bad fall and banged up both my knees and crushed both hands - i hit the pavement HARD with my hands bearing the full brunt of my body weight. My right hand's pretty much back to normal and my left hand still has some pain and slightly reduced functionality. Why am i telling you this? Because it's going to affect the blog. I can type and everything just fine. But when it happened, i had to miss work at a time when i REALLY couldn't afford to do so. (Exhibit #14,781 of Someone Up There Really Hates Me And Wants Me To Just Hurry Up And Die Already.) For someone who's struggling financially and often goes without food so i can pay the bills, this is not a good thing. Of course, either way the end result is basically the same since no electricity equals no internet anyway - and no internet means inability to work on Muppet Freak for an unknown length of time. If i can squeeze out another article or two before that happens, i will but whether or not i do, Muppet Freak will be on hiatus for who knows how long. I do want to get all the archive articles up before the time comes when i have to just let go completely and give up the ghost and i'm really hoping the break won't be too long and i can get back to finishing things up here...but i don't have any realistic way of knowing if that will be possible or if the hiatus coincides with a permanent leave. My Connection is Not a Rainbow One. Thanks to everyone who's contacted me anxiously awaiting my next posts. And here's a song from one of my favorite groups, Shakespears Sister. Not only is it currently an apt tribute to my web service, but for years, i've also tended to start singing this whenever i find myself in a long line. - My internet connection's been spotty lately; when i'm ready to spend some time working on the blog, i can't get on or i get frequent dropouts. - I've been falling back into oversleeping - even though reviving Muppet Freak's helped get me out of the pattern i had fallen into during my severe bout of depression where i was spending any and all possible time in bed, it's still a gradual process and i had a small bit of regression for awhile. So stay tuned - i may not always post every other day or so but hopefully readers enjoy the posts when they do come and as always feedback on what you'd like to see is always encouraged. When Muppet Freaks see a new production, when evaluating it later and discussing it with other fans, one of the primary attributes used to measure it is how "Muppety" it was. Now all of this is very conceptual and subjective - isn't there also a way to measure "Muppetyness" with some more specific degree of measurement? And if so, how could one measure "Muppetyness" anyway? Well, why not with Muppets? Typically when we see something with The Muppets in it, be it a movie, a television show, a 30 second spot, a book, record, or item of merchandise there are the "Big Guns" we expect to see...Kermit, Gonzo, Piggy, Fozzie (with the latter two not even always being a given throughout the late 80's-90's). 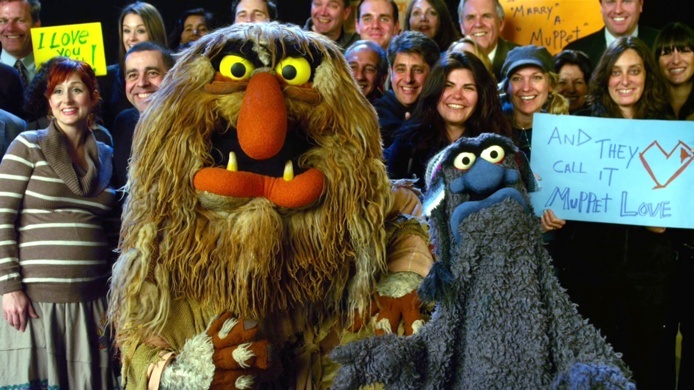 But of course The Muppet group consists of several supporting players, hundreds of minor characters, and thousands of physical puppets that could populate a background. Among that large group, there are certain minor Muppets that always tend to make a project seem extra Muppety when they're present...they don't even have to have a speaking line, but just by showing up they make us feel a sense of warmth; like just by their very inclusion, it's like the creative team is sending the message "Hey, this particular installment is really special because we actually brought out ___ to appear in it!" When these characters are among the group, they seem to validate that this piece of work is worth paying attention to...this isn't just another typical frog-and-pig appearance du jour but rather a lovingly prepared full course meal of Muppety Goodness. 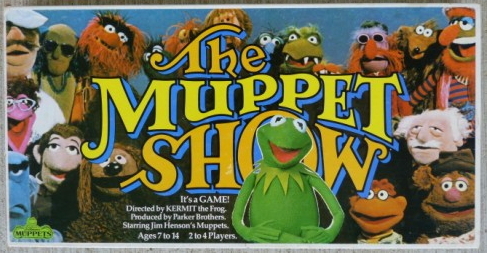 Maybe in the long run when all is said and done, perhaps the production may not have actually been among the all time best when evaluating it in retrospect but when you're actually experiencing it and seeing these characters, it feels like the most sensational, Muppetational thing you've watched lately! Now here's the interesting thing...i'd pretty much picked these characters in the back of my mind as being ambassadors of "Muppetyness" way back during the later seasons of The Muppet Show and for the last 30 years, have considered them perfect symbols of how Muppety a project seems - well before i would have known a whole lot of specific information on each character's genesis...but looking over the list, a great deal of these characters predate The Muppet Show, either having been created for one of its pilots or even dating farther back. The most recent debut for any of the following Muppets would have been Muppet Show Season Two. Which in a way makes sense because if while "eight-year-old d.w." is watching a Season Five episode of The Muppet Show, in order for a character to be able to pop up on the screen and lend a unique sense of familiarity, they'd have to be somewhat established to begin with ... but it still kind of surprises me when i actually look back now and note how so many of these characters were indeed "classic" in that many of their creations took place pre-Muppet Show. So, without further ado, i now present THE MUPPET BAROMETER OF MUPPETY-NESS! The Eleven Muppets That Always Make Something Seem Extra "Muppety" Whenever They So Much As Just Show Up! Perhaps it's because he's one of the rare Muppets that made appearances on both Sesame Street and The Muppet Show (having already existed as a "trunk puppet" before Sesame's debut), when Beautiful Day Monster shows up, he makes things seem particularly "Classic" - in Sesame's first season, he was the one to be scared of - the one most likely to be dangerous or cause trouble. He not only appeared in - but had lines in Sesame Street, The Muppet Show and The Jim Henson Hour! When the trailers for "The Muppets" surfaced, he was spotted in a shot...and then another...and then ANOTHER (and even with costume changes)! He was gonna get some awesome screentime in the new movie and that really got my Muppet Freak self ultra-excited to see this film! 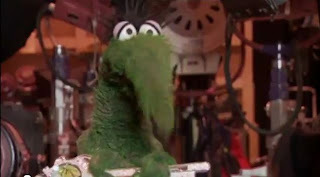 The only Muppet on this list to debut past The Muppet Show's first season (Episode six of Season Two to be exact), Luncheon Counter Monster's more adventurous and complex (while still maintaining a classic Muppet look) design and his penchant for just eating anything he came across indiscriminately immediately made him an essential Muppet Monster. But as the years went on, the great thing about Luncheon was that he could randomly pop up anywhere and everywhere!! The Cosby Show - The Muppet Meeting Films - Statler & Waldorf: From the Balcony - he even had his own solo Muppet Hallmark Card!! Whether alone or part of a herd, LCM is the Symbol of Cool Muppet Monstery! 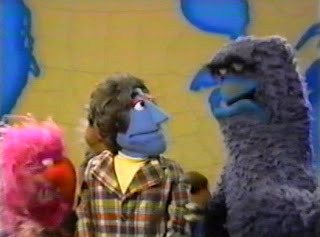 In 1970, a whole group of new Muppet Monsters were created for the Ed Sullivan special The Great Santa Claus Switch - with many of these "graduating" to become The Muppet Show Monsters. In GSCS, they were known as The Frackles. By the time they moved on to TMS, most just became thought of as "Muppet Show Monsters" but two in particular still tended to retain the name "Frackle" on set being referred to as "The Blue Frackle" and "The Green Frackle" and often tending to get a tad more screentime than the other Monsters. As more Monsters were built for TMS over the following seasons, their airtime got slighly more diluted...but it was still a special treat when they came on - and anytime they showed up in a production afterward! 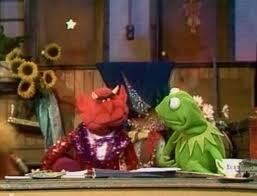 Nothing quite said "Muppet Monster" like Boppity (the Blue Frackle) and Gloat (the Green Frackle)! Boppity even had solo lines in the opening number of Muppet Christmas Carol! ...And speaking of Frackles, we also have Droop. But he's special in his own right! For one, he was one of the few Muppet Monsters to get both a name, regular performer and clearly established personality. 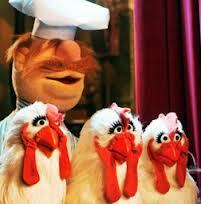 He was heavily featured as a main character during the first Muppet Show pilot, The Muppets Valentine Show. He also had one of the first speaking lines in Muppet Christmas Carol. Droop was just as easily used as part of a pack of Muppet Monsters, as part of a chorus, or in promotional shots appearing in Statler & Waldorf's balcony. For a while, there was a fear that Droop might end up dropped due to the Muppets Tonight director, Nigel, bearing such a strong resemblance to him (but with a polar opposite personality; i always thought if the show had continued that they should have established them as twin brothers) but Droop's featured appearance in "The Muppets" proves he's back, baby! The oldest Muppet on this list, debuting in 1963 where he was built along with Rowlf for Purina Dog Chow commercials, Baskerville may not have become as huge a star as Ol' Brown Ears, but he still always seemed the most Muppety out of all the various Muppet Dogs. Perhaps it's because he's so old-school that whenever he's onscreen, he fetches our full attention! Crazy Harry always lights up the screen...literally! Though truth be told, he doesn't even need to set off an explosion - the puppet has such brilliant expressions built into him and John Lovelady/Jerry Nelson gave him such a unique posture and physicality that i always jump up and down with joy when he's on screen - even if he's just dinging a triangle or just leering at everything around him in a crowd scene. Probably my favorite shot in "The Muppets" trailers was the one of the theme song arches...not only because of them being the theme song arches, but also because of the manic energy that Crazy Harry was singing and dancing with...showing that Harry would do just nicely in Matt Vogel's hands! Of course, being that the whole inspiration behind Crazy Harry was Muppet Builder and prankster extraordinaire Don Sahlin, is it any wonder that Crazy Harry never fails to make everything the most Muppety possible when he's around? ...But in the meantime, there's her "favorite" dancing partner, George the Janitor. Both characters debuted in Muppets Valentine Show with pretty major parts - though they weren't really "paired up" until The Muppet Show's At the Dance segments where they danced together in all but two of the first season's segments. George looked like he could just as easily hang out with Statler & Waldorf if he wasn't cleaning up after pigs and explosions. When Beauregard became the new Muppet Theatre Janitor in season three, that just helped make any George sightings all the more exciting and precious...especially when we got to see him back sweeping things up in his uniform on Muppets Tonight! And he gets the very first singing line in Muppet Christmas Carol.